D Parke Haulage Ltd has been in business for 30 years and D Parke Haulage Ltd have always worked exclusively for Tarmac. D Parke Haulage Ltd currently have three vehicles on the fleet, one 32000kg tipper lorry and two 44000kg articulated vehicle. The company are engaged in aggregates loads both during the day time and at night and work only for Tarmac on these contracts. D Parke Haulage Ltd is based in Radlett and has been at this yard for 30 years. The company have four full time employees, including the Director. We first heard about FORS through Tarmac in 2015. We looked at the benefits of joining the scheme and we saw that these were standards and ethos that we wished to adopt of improving the safety for both our vehicles and drivers and D Parke Haulage Ltd achieved FORS Bronze accreditation in 2016 and then continued to our Silver Accreditation which we achieved in 2018. D Park Haulage Ltd, together with Tarmac have found that the FORS driver training programme, both the classroom based learning and the FORS e-Learning modules have helped raise the safety of our drivers. D Parke Haulage Ltd drivers have also found that the FORS toolbox talks have proved invaluable in the raising the awareness our drivers also. This has led to all our drivers having a better understanding of road safety and raised their awareness of the needs of other vulnerable road users. All our vehicles are fitted with 360 degree cameras, near side proximity sensors and audible left turn alarms, Class IV,V, V1 Mirrors, flashing beacons on the cab of all vehicles, cyclist safety stickers to both the rear and sides of our vehicles and overhead power cable detectors. All our drivers have completed Safe Urban Driver courses and have completed all the FORS E-Learning Modules. The company have an active replacement program in place, and in December have just taken delivery of a new 18 plate 32000kg tipper vehicle, which is also equipped to above the FORS requirement and has a Euro 6 engine. 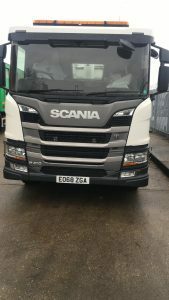 The company have also an order in for a new 44000kg articulated vehicle in April 2019 and this will also be equipped to above the FORS requirements. This vehicle will also be Euro 6 compliant. This year the company have seen a 1.1 percentage improvement in fuel, due to the introduction of our Euro 6 vehicle, together with a better driver awareness on anti-idling and FORS e-learning. Once we had gained our Bronze accreditation in 2015, the company decided to go for Silver Accreditation in 2018, as we felt that were already doing most of what was required of us to gain the Silver accreditation. D Parke Haulage Ltd are now at the stage where we feel that we should set an example to others by showing our competitors the benefits of FORS Gold. All our drivers are required to fill in an in-depth medical declaration on an annual basis even though through the FORS Standards it is recommended every 5 years. It is mentioned in the driver’s handbook, which requires the drivers to report any change to the company and forms part of their contract of employment. D Parke Haulage Ltd, whilst a small company, have recently implemented a recruitment policy to the company, that outlines that we as a company are committed to employing young drivers/employees where possible and training them into that role. Achieving Gold will help the company to work towards goals that will help to improve the industry’s safety standards, whilst looking towards reducing our emissions through less polluting vehicles.